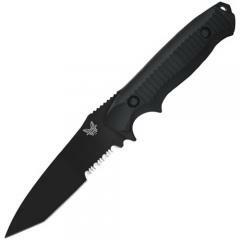 Benchmade 141SBK 141SBK Nimravus Tanto Combo Edge Knife FREE SHIPPING! Now you can get the same great performance and design features found in the Model 140 Nimravus®, in a true Tanto blade style. We have had scores of requests from Special Ops personnel on both the Law Enforcement and Military fronts who were very satisfied with the Nimravus design, but preferred the altered blade shape. All early indications are that the Model 141 hits the mark. ©2002-2019 CopsPlus.com: Benchmade 141SBK 141SBK Nimravus Tanto Combo Edge Knife FREE SHIPPING!